The publication of my memoir, Bike Hunt, gave me the opportunity to present at various venues and through various media about the power of bicycles for improving our world. 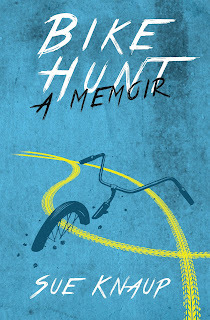 Even though, or perhaps because Bike Hunt covers my struggle toward that goal, the book offers the perfect backdrop for intense discussions on this topic. The bicycle is the greatest machine ever invented because it provides so much for so little. With simple pedal strokes it will transport a person six times faster than walking and can carry hundreds of pounds. It is easy to make and available in all parts of the world. When people choose to travel by bike, they not only improve their own physical health, but the health of their communities by reducing emissions and noise. And yet, in most countries, bicycles are only used for fewer than ten percent of trips. Central to my presentation are the many disturbing barriers to bicycles being used as a tool for social change. Since the 1950s, the U.S. bicycle industry has presented bicycles as toys. On top of that, their push to sell bicycle helmets has stigmatized bicycling as far more dangerous than it actually is. Though car occupants suffer 25 times more head injuries than cyclists, the car industry would never dream of promoting helmets for their customers. Then there is Hollywood with its portrayal of cyclists as dorks. So it’s no wonder bicycles are forgotten by social movements (see my last post on Civil Rights) and even the environmental movement. The other barrier is one that is faced by all nonprofits – group dysfunction. In Bike Hunt, I delve into many of the causes of this, including power grabs and infighting. Unfortunately, because our bicycle movement is so fragile and undermined by our bike industry and other stigmas, bicycle nonprofits cannot withstand the forces of group dysfunction like nonprofits in other movements. I show in Bike Hunt and my presentations how to overcome these barriers first by recognizing them then stopping them at the slightest hint. If you have run into these sorts of struggles or more, please read the book and visit www.OneStreet.org to tap into the resources there.